Making a holiday budget is easy. Sticking to it is the tricky part. Between buying gifts for friends and family, planning for parties, and all of the other miscellaneous expenses associated with the holidays, having a concrete budget is one of the most important things you can do. Here are eight ways to help you stick to your holiday budget. 1. FIRST, MAKE A BUDGET. The first step may sound simple, but the only way to stick to a budget is to actually have one in the first place. Many people either just shoot for a ballpark amount or simply gauge how much they’re spending based on memory. Skipping this step is an easy way to find yourself spending more than you intended. Instead, do a few calculations for a budget based on your monthly expenses to find a more concrete number for your holiday spending. Once the budget is in place, you can start planning your holiday. 2. TAKE EVERY EXPENSE INTO ACCOUNT. Make sure you record every holiday-related expense, even if it feels insignificant at the time. Small items, such as wrapping paper, bows, and tiny add-on gifts can slowly build up, leaving you with less money to spend on the more important things. If you’re keeping track of even the most trivial expenses, you’ll be able to better visualize your budget and make any necessary adjustments. 3. DON’T VEER FROM YOUR LIST. Once you have a list of people you’re buying gifts for and what you’re going to get them, don’t make any sudden changes. Impulse items and last-minute additions can put a dent in your budget, no matter how carefully you planned it out. So once you have your budget tallied—stick to it. And if you do have to make any alterations, try to swap things out with an item of equal value. 4. USE THE 24-HOUR RULE. When making an expensive purchase this holiday season—like on a gift for a loved one or even one for yourself—take some time and think it over. If you see an item in the store, especially something on the pricey side, don’t buy it right away. Instead, sleep on it, and if you still think you need it, go and purchase it a day or two later. For online orders, leave it in your shopping cart for a day but don’t check out. Come back the next day and make a final decision. You might even find that by waiting, you’re able to take advantage of a new sale or deal. Once the initial excitement of seeing an item wears off, you may realize you don’t need it after all. Remember, your friends and family aren’t expecting you to break the bank for them, so if that ultra-expensive gift just isn’t reasonable, something less expensive, but more thoughtful, will work just as well. 5. START PLANNING FOR NEXT YEAR. The holiday shopping season may officially start on Black Friday, but you can skip the crowded malls and save yourself some money in the process by kicking things off earlier in 2018. Way earlier. Certain gifts—like winter coats, scarves, and boots—may be a fraction of their normal price in the spring and the summer. Same with decorations—artificial Christmas trees and other holiday staples will be significantly reduced if you look to buy in the months immediately after the holiday season. 6. SET ASIDE MONEY FOR NEXT YEAR. It’s easier to work within your budget if you’ve been planning all year to have the right amount of money for your holiday needs. Set aside a little money from each paycheck in anticipation of your 2018 holiday spending. Some financial institutions will even let you create a separate account that automatically debits a little from your checking account every month and holds it until the holidays. If you’ve planned ahead, your November and December budgets won’t have to carry all the burden of the holiday season. 7. DOWNLOAD A SHOPPING APP. Apps can be a great ally for your holiday budget. Some apps can send you the best deals and coupons from all of your favorite stores, while others can organize and calculate your budget to ensure that you’re not going overboard. 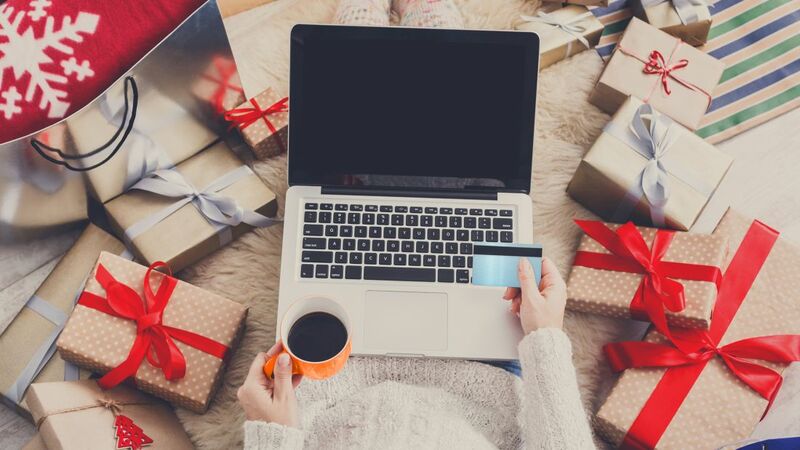 If you’re feeling overburdened typing away on a calculator or have a wallet full of random coupons, a quick internet search can find the perfect digital shopping companion for the holidays. 8. KNOW YOUR CREDIT CARD REWARDS. Your credit card could be one of your best friends when it comes to saving money over the holidays. Many card companies offer cash back deals that can pad your bottom line, such as Discover’s Match program, which will match all the cash back you earn at the end of your first year with the card. Deals like this can be a nice boost down the road while you’re buying gifts and preparing for parties, so be sure you know every deal your card offers this holiday season. Knowing you’re getting extra cash back from your credit card is like a gift to yourself, and with Discover matching all the cash back you earn at the end of your first year as a cardholder, you’ll be able to spread cheer into next year. Terms apply. Learn more at Discover.com.